Alicante (, [aliˈkante]), or Alacant ([alaˈkant]), both the Spanish and Valencian being official names, is a city and port in Spain on the Costa Blanca, the capital of the province of Alicante and of the comarca of Alacantí, in the south of the Valencian Community. It is also a historic Mediterranean port. The population of the city of Alicante proper was 330,525, estimated as of 2016, ranking as the second-largest Valencian city. Including nearby municipalities, the Alicante conurbation had 452,462 residents. The population of the metropolitan area (including Elche and satellite towns) was 757,085 as of 2014 estimates, ranking as the eighth-largest metropolitan area of Spain. The name of the city echoes the Arabic name Laqant (لَقَنْت) or Al-Laqant (ألَلَقَنْت), which in turn reflects the Latin Lucentum. The area around Alicante has been inhabited for over 7000 years. The first tribes of hunter-gatherers moved down gradually from Central Europe between 5000 and 3000 BC. Some of the earliest settlements were made on the slopes of Mount Benacantil. By 1000 BC Greek and Phoenician traders had begun to visit the eastern coast of Spain, establishing small trading ports and introducing the native Iberian tribes to the alphabet, iron and the pottery wheel. The town of Leuce Akra (white cape) was then founded by Greek settlers from Marseille around 325/324 b.C. By the 3rd century BC, the rival armies of Carthage and Rome began to invade and fight for control of the Iberian Peninsula. The Carthaginian general Hamilcar Barca established the fortified settlement of Akra Leuka (Greek: Ἄκρα Λευκή, meaning "White Mountain" or "White Point"), where Alicante stands today. Although the Carthaginians conquered much of the land around Alicante, the Romans would eventually rule Hispania Tarraconensis for over 700 years. By the 5th century AD, Rome was in decline and the Roman predecessor town of Alicante, known as Lucentum (Latin), was more or less under the control of the Visigothic warlord Theudimer. However neither the Romans nor the Goths put up much resistance to the Arab conquest of Medina Laqant in the 8th century. The Moors ruled southern and eastern Spain until the 13th century Reconquista (Reconquest). Alicante was finally taken in 1246 by the Castilian king Alfonso X, but it passed soon and definitively to the Kingdom of Valencia in 1298 with King James II of Aragon. It gained the status of Royal Village (Vila Reial) with representation in the medieval Valencian Parliament (Corts Valencianes). After several decades of being the battlefield where the Kingdom of Castile and the Crown of Aragon clashed, Alicante became a major Mediterranean trading station exporting rice, wine, olive oil, oranges and wool. But between 1609 and 1614 King Felipe III expelled thousands of Moriscos who had remained in Valencia after the Reconquista, due to their cooperation with Barbary pirates who continually attacked coastal cities and caused much harm to trade. This act cost the region dearly; with so many skilled artisans and agricultural labourers gone, the feudal nobility found itself sliding into bankruptcy. Things got worse in the early 18th century; after the War of Spanish Succession, Alicante went into a long, slow decline, surviving through the 18th and 19th centuries by making shoes and growing agricultural produce such as oranges and almonds, and thanks to its fisheries. The end of the 19th century witnessed a sharp recovery of the local economy with increasing international trade and the growth of the city harbour leading to increased exports of several products (particularly during World War I when Spain was a neutral country). During the early 20th century, Alicante was a minor capital that enjoyed the benefit of Spain's neutrality during World War I, and that provided new opportunities for local industry and agriculture. The Rif War in the 1920s saw numerous alicantinos drafted to fight in the long and bloody campaigns in the former Spanish protectorate (Northern Morocco) against the Rif rebels. The political unrest of the late 1920s led to the victory of Republican candidates in local council elections throughout the country, and the abdication of King Alfonso XIII. The proclamation of the Second Spanish Republic was much celebrated in the city on 14 April 1931. The Spanish Civil War broke out on 17 July 1936. Alicante was the last city loyal to the Republican government to be occupied by General Franco's troops on 1 April 1939, and its harbour saw the last Republican government officials fleeing the country. Vicious air bombings were targeted on Alicante during the three years of civil conflict, most notably the bombing by the Italian Aviazione Legionaria of the Mercado de Abastos on 25 May 1938 in which more than 300 civilians perished. The late 1950s and early 1960s saw the onset of a lasting transformation of the city by the tourist industry. Large buildings and complexes rose in nearby Albufereta (e.g. El Barco) and Playa de San Juan, with the benign climate being the biggest draw to attract prospective buyers and tourists who kept the hotels reasonably busy. New construction benefited the whole economy, as the development of the tourism sector also spawned new businesses such as restaurants, bars and other tourist-oriented enterprises. Also, the old airfield at Rabassa was closed and air traffic moved to the new El Altet Airport, which made a more convenient and modern facility for charter flights bringing tourists from northern European countries. When Franco died in 1975, his successor Juan Carlos I played his part as the living symbol of the transition of Spain to a democratic constitutional monarchy. The governments of regional communities were given constitutional status as nationalities, and their governments were given more autonomy, including that of the Valencian region, the Generalitat Valenciana. The Port of Alicante has been reinventing itself since the industrial decline the city suffered in the 1980s (with most mercantile traffic lost to Valencia's harbour). In recent years, the Port Authority has established it as one of the most important ports in Spain for cruises, with 72 calls to port made by cruise ships in 2007 bringing some 80,000 passengers and 30,000 crew to the city each year. The moves to develop the port for more tourism have been welcomed by the city and its residents, but the latest plans to develop an industrial estate in the port have caused great controversy. Until the global recession which started in 2008, Alicante was one of the fastest-growing cities in Spain. The boom depended partly on tourism directed to the beaches of the Costa Blanca and particularly on the second residence-construction boom which started in the 1960s and revived again by the late 1990s. Services and public administration also play a major role in the city's economy. The construction boom has raised many environmental concerns and both the local autonomous government and city council are under scrutiny by the European Union. The construction surge was the subject of hot debates among politicians and citizens alike. The latest of many public battles concerns the plans of the Port Authority of Alicante to construct an industrial estate on reclaimed land in front of the city's coastal strip, in breach of local, national and European regulations. (See Port of Alicante for details). The city serves as the headquarters of the European Union Intellectual Property Office and a sizeable population of European public workers live there. The campus of the University of Alicante lies in San Vicente del Raspeig, bordering the city of Alicante to the north. More than 27,000 students attend the University. Since 2005 Ciudad de la Luz, one of the largest film studios in Europe, has had its base in Alicante. The studio has shot Spanish and international movies such as Asterix at the Olympic Games by Frédéric Forestier and Thomas Langmann, and Manolete by Menno Meyjes. 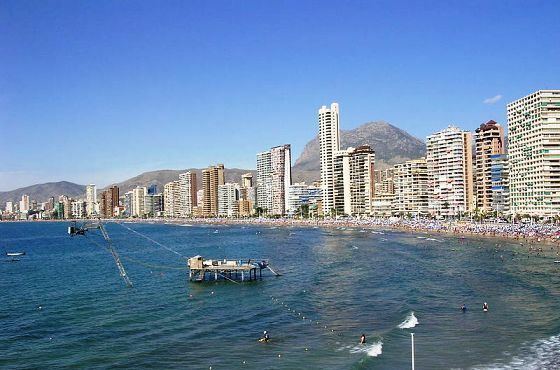 The official population of Alicante in 2014 was 332,067 inhabitants and 757,085 in the metropolitan area "Alicante-Elche". About 15% of the population is foreign, most of them immigrants from Argentina, Ecuador, United Kingdom and Colombia who have arrived in the previous 20 years. There are also immigrants from other countries such as Germany, Romania, Russia, Algeria, Ukraine, Morocco and Italy, many of whom coming outside the EU are under illegal alien status and therefore are not accounted for in official population figures. The real percentage of foreign residents is higher, since the Alicante metropolitan area is home to many Northern European retirees who are officially still residents of their own countries. In the same pattern, a sizable number of permanent residents are Spanish nationals who officially still live in Madrid, the Basque provinces, or other areas of the country. Gabriel Echávarri is the Mayor of the city. He was elected for the post on June 13, 2015, following the municipal elections on May 24, 2015. He was supported by the votes from his own group (6), plus those from leftist parties Guanyar Alacant (6) and Compromís (3), as well as from centre-right party Ciudadanos (6). The People's Party (Partido Popular, PP), with only 8 elected seats, lost the majority. In the previous municipal elections of May 2011, Sonia Castedo of People's Party won the elections with an absolute majority, but resigned in December 2014 due to her involvement in several corruption scandals, at present being under investigation. Her fellow party member Miguel Valor went on to become mayor up until Echávarri's election. At the foot of the main staircase of the City Hall Building (Ayuntamiento) is the zero point (cota cero), used as the point of reference for measuring the height above or below sea level of any point in Spain, due to the marginal tidal variations of the Mediterranean sea in Alicante. Alicante enjoys mild winter temperatures, hot summers and little rain, concentrated in equinoctial periods. The climate of the Alicante region according to Köppen climate classification is a Hot semi-arid climate (BSh). On average the temperature ranges between 17.0 °C (63 °F) and 6.7 °C (44 °F) in January, and between 30.8 °C (87 °F) and 21.5 °C (71 °F) in August, with an average annual temperature of 18.3 °C (65 °F). Daily variations in temperature are generally small because of the stabilising influence of the sea, although occasional periods of westerly wind can produce temperature changes of 15 °C (27 °F) or more. Seasonal variations in temperature are also relatively small, meaning that winters are mild and summers are hot. The average rainfall is 277 mm (10.9 in) per year. The cold drop means that September and October are the wettest months. Rarely, the rainfall can be torrential, reaching over 100 mm (4 in) in a 24-hour period, leading to severe flooding. Because of this irregularity, only 35 rainy days are observed on average per year, and the annual number of sunshine hours is 2,953. The record maximum temperature of 41.4 °C (107 °F) was observed on 4 July 1994. The record minimum temperature of −1.6 °C (29 °F) was recorded on 2 January 1971. The worst flooding in modern history occurred on 30 September 1997 when 270.2 mm (10.6 in) of rain fell within six hours. Temperatures under 2 °C (36 °F) are very rare. Snow is unknown since 1926 The climate of Alicante is very similar to the climate of Los Angeles, California. Alicante Airport outranks its Valencian counterpart, being among the busiest airports in Spain after Madrid, Barcelona, Palma de Mallorca and Málaga. It is connected with Madrid and Barcelona by frequent Iberia and Vueling flights, and with many Western European cities through carriers such as Ryanair, Easyjet, Air Berlin, Monarch Airlines, and Jet2.com. There are also regular flights to Algeria and Russia. Alicante railway station is used by Cercanías linking Alicante with suburbs and Murcia. Long-range RENFE trains run frequently to Madrid, Barcelona, and Valencia. Alicante Tram connects the city with outlying settlements along Costa Blanca. As of 2011, electric tram-trains run up to Benidorm, and diesel trains go further to Dénia. The city has regular ferry services to the Balearic Islands and Algeria. The city is strongly fortified, with a spacious harbour. Amongst the most notable features of the city are the Castle of Santa Bárbara, which sits high above the city, and the port of Alicante. The latter was the subject of bitter controversy in 2006–2007 as residents battled, successfully, to keep it from being changed into an industrial estate. The Santa Bárbara castle is situated on Mount Benacantil, overlooking the city. The tower (La Torreta) at the top, is the oldest part of the castle, while part of the lowest zone and the walls were constructed later in the 18th century. The promenade Explanada de España, lined by palm trees, is paved with 6.5 million marble floor tiles creating a wavy form and is one of the most lovely promenades in Spain. The Promenade extends from the Port of Alicante to the Gran Vía and ends at the famous statue of Mark Hersch. For the people of Alicante, the promenade is the meeting place for the traditional Spanish paseo, or stroll along the waterfront in the evenings, and a venue for outdoor musical concerts. At the end of the promenade is a monument by the artist Bañuls of the 19th century. Barrio de la Santa Cruz is a colourful quarter of the old city, situated on the south-west of Santa Bárbara castle. Its small houses climb up the hill leading to the walls and the castle, through narrow streets decorated with flags and tubs of flowers. L'Ereta Park is situated on the foothills of Mount Benacantil, on the way to the castle. 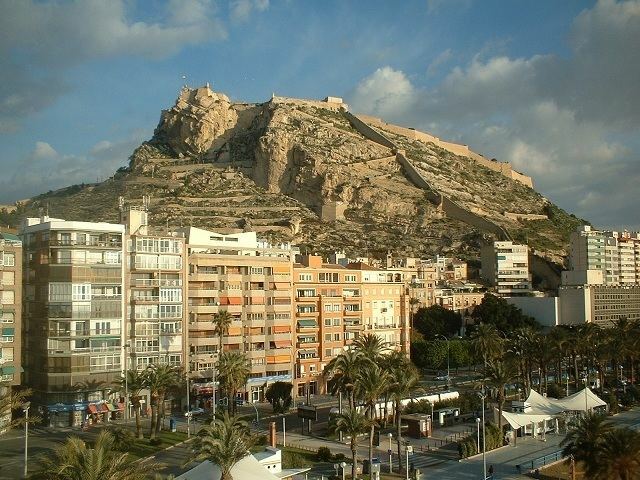 It runs from the Santa Bárbara castle down to the old part of Alicante and consists of several levels, routes, decks and rest stops which offer a panoramic view overlooking the city. El Palmeral Park is one of the favorite parks of Alicante's citizens. It includes walking trails, children's playgrounds, ponds and brooks, picnic tables and an auditorium for concerts. Just a few kilometers from Alicante on the Mediterranean Sea lies Tabarca island. What was once a haven for Barbary pirates is now a beautiful tourist attraction. Basilica of Santa María (14th–16th centuries), built in Gothic style over the former main mosque. Other features include the high altar, in Rococo style, and the portal, in Baroque style, both from the 18th century. Co-cathedral of St. Nicholas of Bari (15th–18th centuries), also built over a mosque. It is the main church of Alicante and the bishop's seat. Monastery of Santa Faz (15th century), located 5 kilometres (3 miles) outside the city, in Baroque style. Defence towers of the Huerta de Alicante (15th–18th centuries), built to defend against the Barbary pirates. Today some 20 towers are still extant. Baroque Casa de La Asegurada (1685), the most ancient civil building in the city. (s. XVII). Today it is home to the Museum of Contemporary Art of Alicante. Casa consistorial de Alicante (18th century), also in Baroque style. Convent of the Canónigas de San Agustín (18th century). Gravina Palace (1748–1808), nowadays hosting Gravina Museum of Fine Arts. There are a dozen museums in Alicante. On exhibition at the Archaeological Museum of Alicante (MARQ) are local artifacts dating from 100,000 years ago till the early 20th century. The collection is divided into different rooms representing three divisions of archaeological methodology: ground, urban and underwater archaeology, with dioramas, audiovisual and interactive zones. The archaeological museum won the European Museum of the Year Award in 2004. Gravina Museum of Fine Arts presents a number of paintings and sculptures from the 16th century to the 19th century. Asegurada Museum of Contemporary Art houses a major collection of twentieth-century art, composed mainly of works donated by Eusebio Sempere. The most important festival, the Bonfires of Saint John (Fogueres de Sant Joan), takes place during the summer solstice. This is followed a week later by seven nights of firework and pyrotechnic contests between companies on the urban beach Playa del Postiguet. 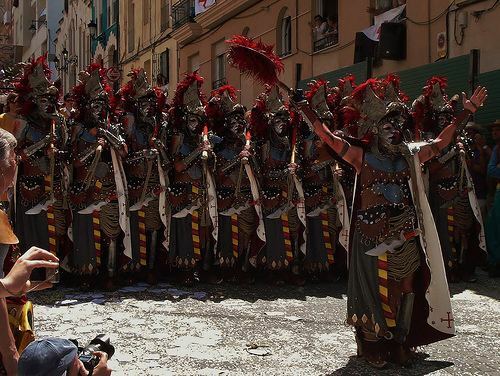 Another well-known festival is Moros i Cristians in Altozano or San Blas district. Overall, the city boasts a year-round nightlife for the enjoyment of tourists, residents, and a large student population of the University of Alicante. The nightlife social scene tends to shift to nearby Playa de San Juan (St. John's Beach) during the summer months. Every summer in Alicante, a two-month-long programme of music, theatre and dance is staged in the Paseo del Puerto. The two established Alicante football teams are Hércules CF, which competes in the Spanish Segunda División B, and Alicante CF, which plays in Tercera División and was dissolved in 2014 due to economic problems. Hércules CF is more well known as it was in the first division in Spain during 96/97 and had many popular players such as David Trezeguet, Royston Drenthe and Aedo Valvez. It is also known because, thanks to this team beating Barcelona, Real Madrid won the league in 1997. Nowadays their home games are played in the Estadio José Rico Pérez. Basketball club Lucentum Alicante participates in the Spanish basketball league. It plays in the Centro de Tecnificación de Alicante. Alicante serves as headquarters and the starting point of Volvo Ocean Race, a yacht race around the world. The latest race sailed in October 2014. In 2009 a bid was made to twin Newcastle, United Kingdom, with Alicante.